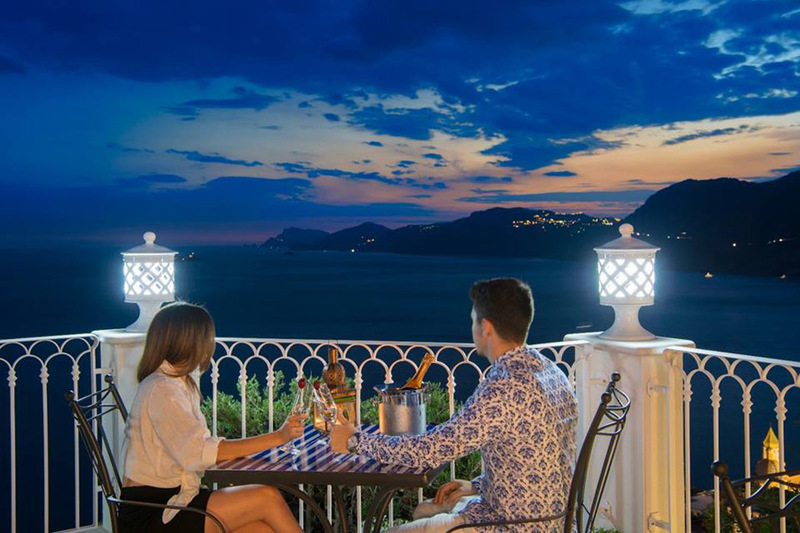 in the center of the Amalfi Coast, which slopes towards the sea with its white and shimmering houses with domed roofs, and the vivid color notes of the lemon groves, citrus groves, bougainvilleas, multicolored plants. 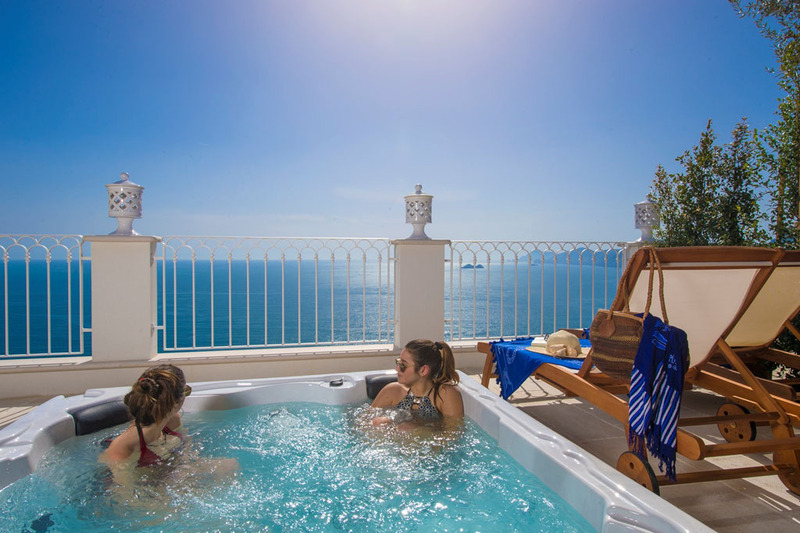 Located a short distance from the path that leads to the amazing Sentiero degli Dei, from the idyllic beaches of Gavitella and Praia, the b & b La Barbera is perfect for organizing beautiful excursions along the Amalfi Coast. We are pleased to welcome you to the Bed and Breakfast La Barbera, in Praiano, a magnificent locality in the center of the Amalfi Coast, which slopes towards the sea with its white and shimmering houses with domed roofs, and the vivid color notes of the lemon groves, citrus groves, bougainvilleas, multicolored plants. 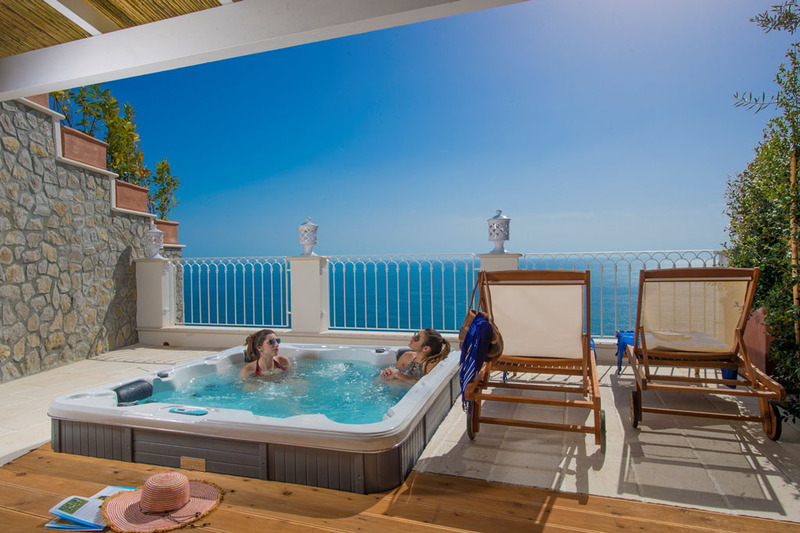 Located a short distance from the path that leads to the amazing Sentiero degli Dei, from the idyllic beaches of Gavitella and Praia, the b & b La Barbera is perfect for organizing beautiful excursions along the Amalfi Coast. You can visit the wonders of Positano, the Emerald Grotto in Conca dei Marini, the Fiordo of Furore, the historic towns of Amalfi and Atrani, the medieval centers of Scala and Ravello, the Roman villa in Minori, the factory of hand painted pottery in Vietri sul Mare. 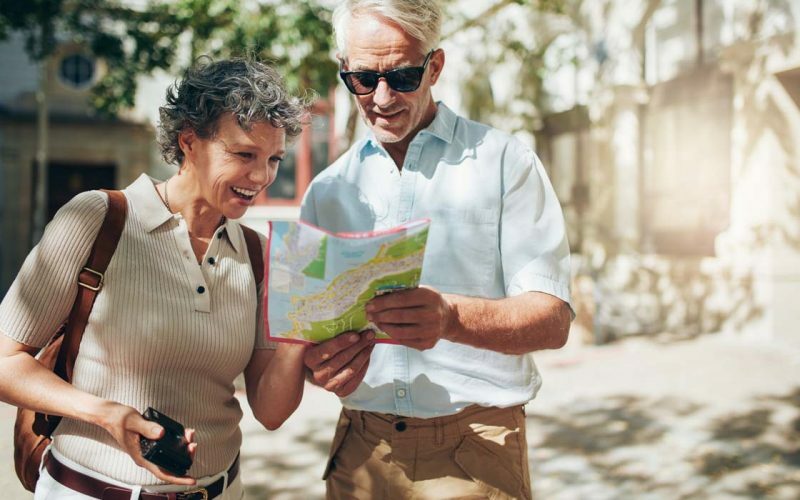 You can also reach the marvelous archaeological sites of Pompeii, Herculaneum, Vesuvius, the islands of Capri and Ischia, Sorrento and Naples. 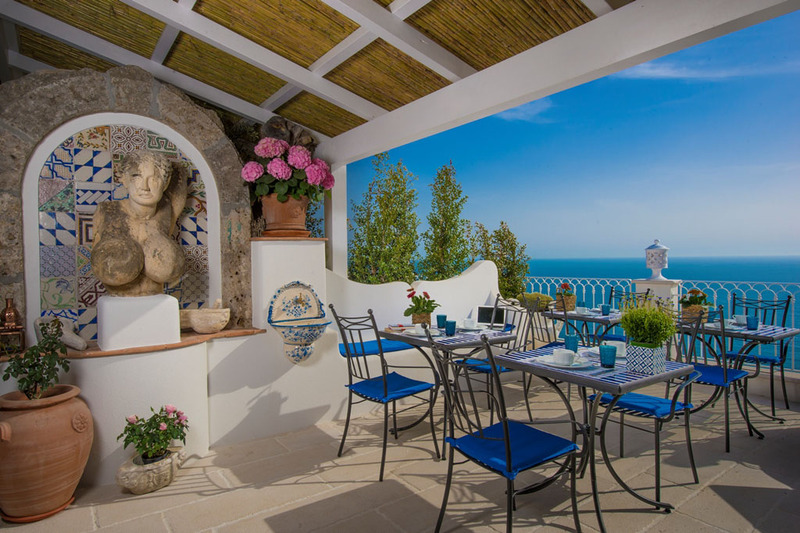 La Barbera bed and breakfast offers private parking, a lift to reach the various levels of the structure, reception, breakfast room and outdoor panoramic terrace for delicious breakfast on the sea. Our elegant rooms, surrounded by the immensity of the natural light of the sky and the splendour of the sea, combine all modern comforts with luxury design elements, traditional craftsmanship, and fine furnishings.The marvelous and luxurious rooms on the sea of ​Bed and breakfast La Barbera: bright and elegant, equipped with all comforts, with a romantic atmosphere of a thousand and one nights! The Grotta del Diavolo owes its name to the characteristic cave crossed by the Amalfi Coast road. It is worth a stop before the entrance to the gallery to admire the traditional nativity scene set up by the skilled hands of a local craftsman who, for several years. The tower Torre a Mare, with its spectacular cylindrical shape, is one of the most beautiful towers of the Amalfi Coast and of Praiano. Probably dating back to the second half of the 1500s, it was one of the viceregal towers along the coast. 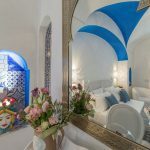 La Barbera bed and breakfast offers you a relaxing and romantic stay in its bright rooms on the sea, furnished with taste and luxury details, equipped with all comforts and services. 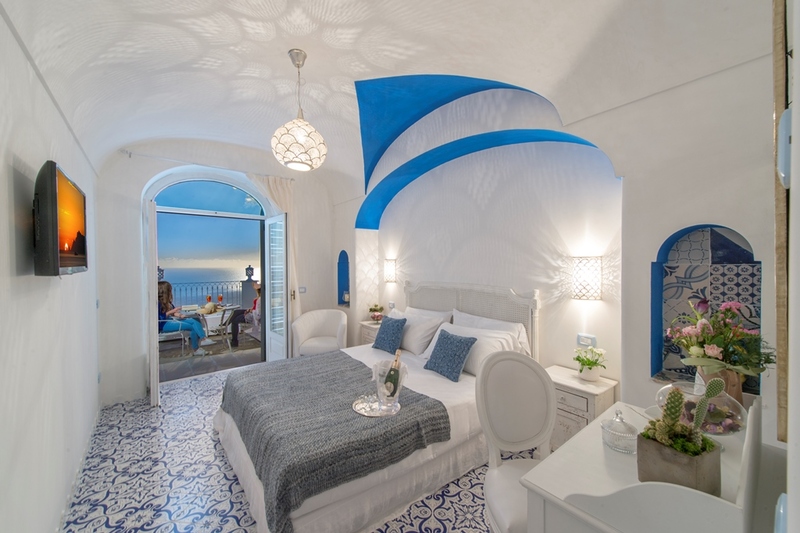 Handcrafted majolica from Vietri sul Mare, the unique design of the furniture, the elegant accessories, the color notes that reflect the enchantment of the sea on which our rooms overlook, are all carefully chosen elements to recreate a dreamlike atmosphere. 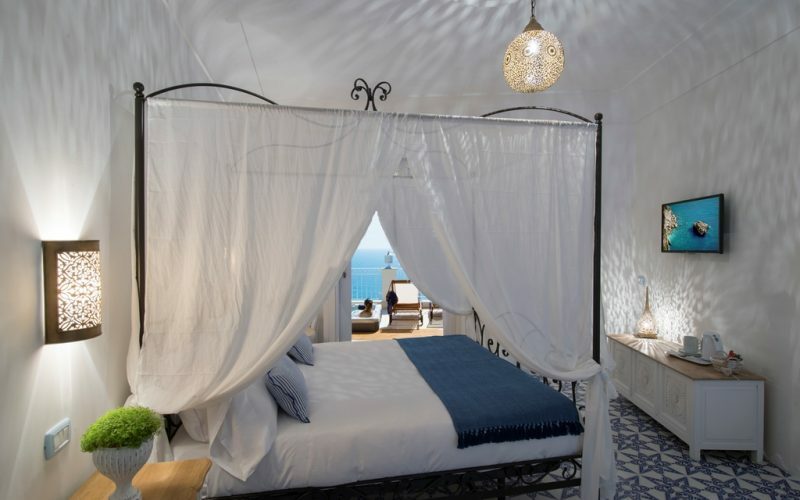 Each room has an independent access and is equipped with a private bathroom with hydromassage shower and a wonderful private terrace, panoramic and equipped with table, sun loungers and chairs. 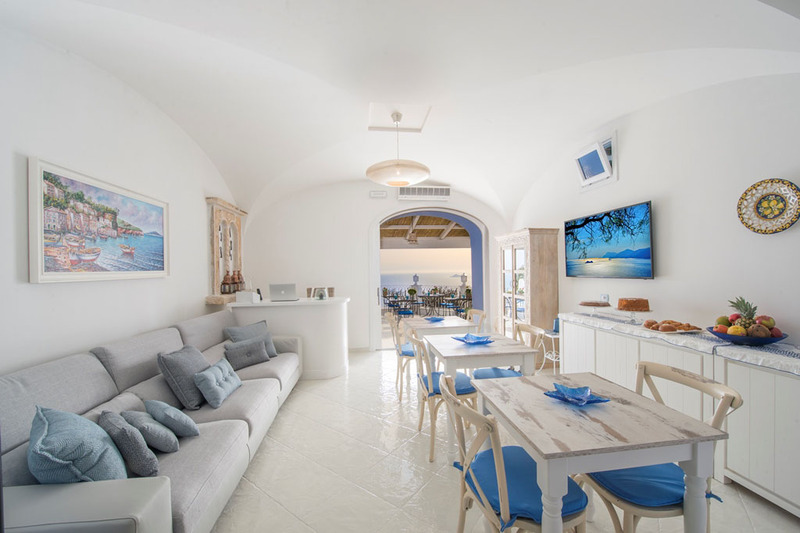 Our suites, double or triple, also offer you a private terrace with sunbathing area, equipped with sunbeds, tables, and chairs, outdoor shower, and/or mini Jacuzzi pool. The rooms are equipped with soundproof walls and doors, air-conditioning, independent heating in summer and winter, USB, free Wi-Fi, mini bar, LCD TV, safe, desk with chair, wardrobe, bedside tables, queen size mattress, small armchair, furnishings in natural wood and with exclusive elements of local craftsmanship. 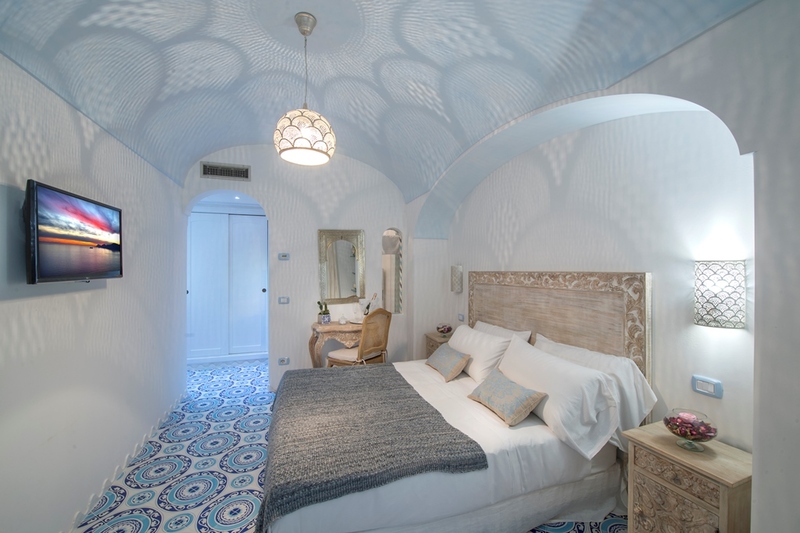 Praiano’s poetry is also in the charming names chosen for the rooms. These are some of the magical places that you can visit during your stay: La Gavitella beach, the ancient tower Torre a Mare, the Grotto of the devil, the Torre del Grado, La Fontana del Altare. 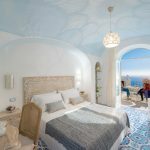 The enchanting view from the Bed and Breakfast La Barbera rooms spans the marvelous sea, the sinuous profiles of the mountains as far as Punta Campanella, Capri with the Faraglioni, Positano and, in the sea, towards the archipelago of Li Galli, the islands from which the sirens enchanted Ulysses: emotions for you from dawn to dusk. An extraordinary natural spectacle will welcome your awakening with the soft notes of the sky, the purity of the air at all hours of the day, the calm of the local daily life, the golden notes with which the sun at sunset paints the sea, the nuances that the sky assumes in an infinity of notes. 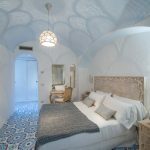 La Barbera bed and breakfast offers you a relaxing and romantic stay in its bright rooms on the sea, furnished with taste and luxury details, equipped with all comforts and services. 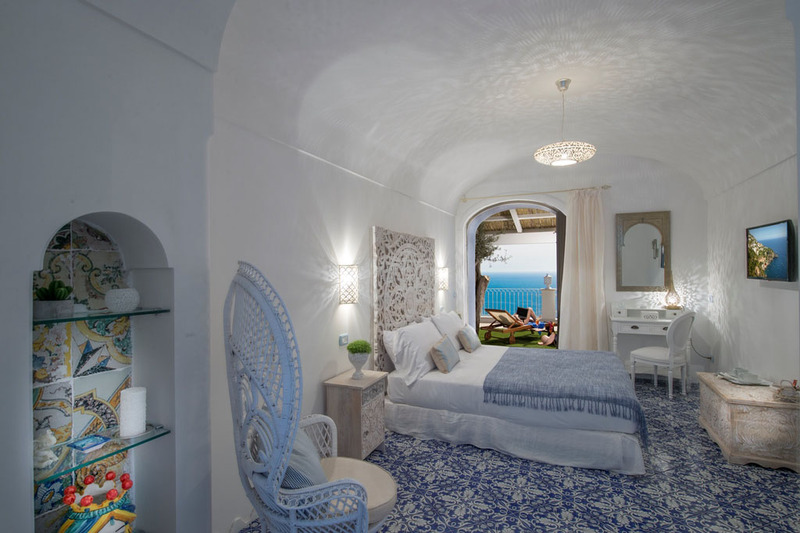 Handcrafted majolica from Vietri sul Mare, the unique design of the furniture, the elegant accessories, the color notes that reflect the enchantment of the sea on which our rooms overlook, are all carefully chosen elements to recreate a dreamlike atmosphere. 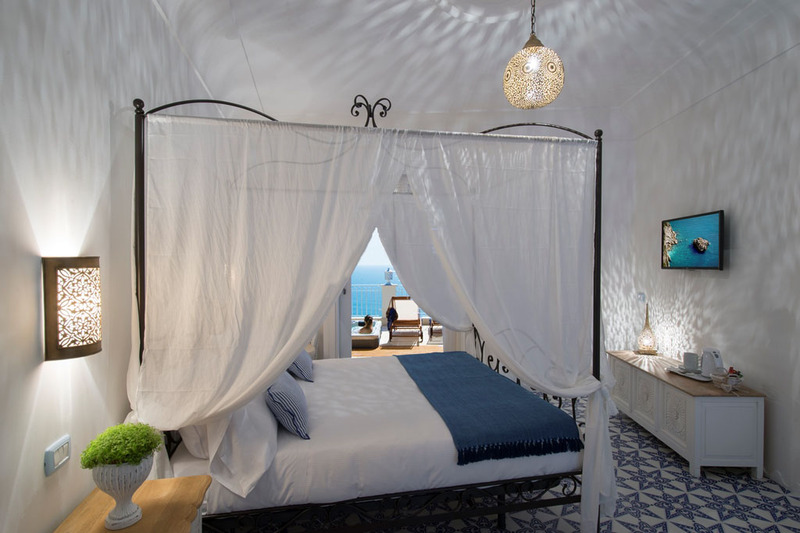 Each room has an independent access and is equipped with a private bathroom with hydromassage shower and a wonderful private terrace, panoramic and equipped with table, sun loungers and chairs. Our suites, double or triple, also offer you a private terrace with sunbathing area, equipped with sunbeds, tables, and chairs, outdoor shower, and/or mini Jacuzzi pool. The rooms are equipped with soundproof walls and doors, air-conditioning, independent heating in summer and winter, USB, free Wi-Fi, mini bar, LCD TV, safe, desk with chair, wardrobe, bedside tables, queen size mattress, small armchair, furnishings in natural wood and with exclusive elements of local craftsmanship. Praiano’s poetry is also in the charming names chosen for the rooms. These are some of the magical places that you can visit during your stay: La Gavitella beach, the ancient tower Torre a Mare, the Grotto of the devil, the Torre del Grado, La Fontana del Altare. 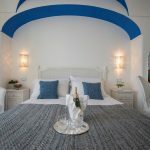 The enchanting view from the Bed and Breakfast La Barbera rooms spans the marvelous sea, the sinuous profiles of the mountains as far as Punta Campanella, Capri with the Faraglioni, Positano and, in the sea, towards the archipelago of Li Galli, the islands from which the sirens enchanted Ulysses: emotions for you from dawn to dusk. An extraordinary natural spectacle will welcome your awakening with the soft notes of the sky, the purity of the air at all hours of the day, the calm of the local daily life, the golden notes with which the sun at sunset paints the sea, the nuances that the sky assumes in an infinity of notes. The taste of tradition and a rich and wide choice for breakfast of fresh and genuine products, the unmissable excursions and services of b & b La Barbera, will make unique and magical your stay on the Amalfi Coast . The delicious breakfasts at La Barbera b & b offer the products of the ancient local traditions; the tasty breakfast buffet is rich in zero mile products, organic, for vegans and celiacs, PDOs and PGIs products, handmade cakes prepared following ancient family recipes. 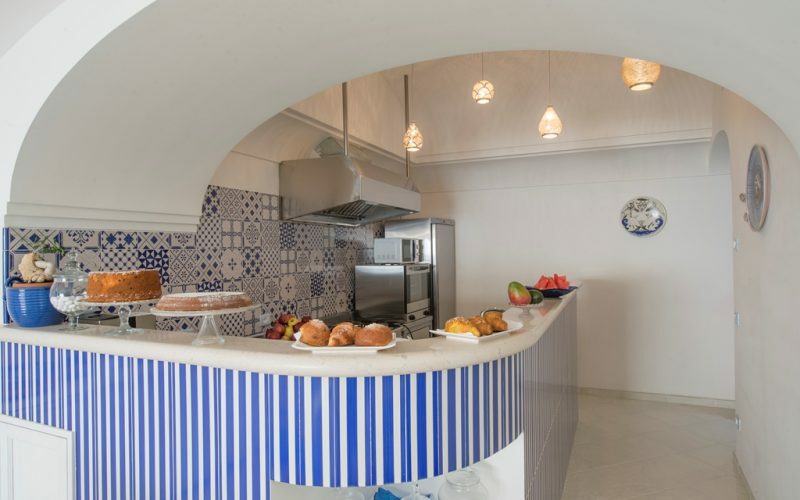 The breakfast room is equipped with tables and chairs indoors and even outdoors with sea-view, in the shade of a nice pergola; the indoors are all air-conditioned and have free Wi-Fi. The reception of bed and breakfast La Barbera welcomes you with the lounge bar area, with sofas and LCD TV for your moments of relaxation. Our staff is at your disposal for all the useful information to make your stay full of events and unmissable excursions. On request, we offer cooking classes and pizza class, tourist guide, wellness treatment, transfer service to the airport or stations, advice on eco-tourism itineraries, food and wine tours, information on Trekking trails, the Path of the Gods, the path that leads to the Monastery of Santa Maria del Castro, on how to reach the beaches of Gavitella and Praia, on summer events and concerts on the path of the gods, on the summer festivities in honor of San Domenico with the famous and exciting Luminaria.We will also offer you information on car rental, with or without a driver, and motorcycles, scooters, and bicycles rental.To extend your stay in Praiano, before check-in or after check-out, b & b La Barbera offers you the possibility of luggage storage, on request. 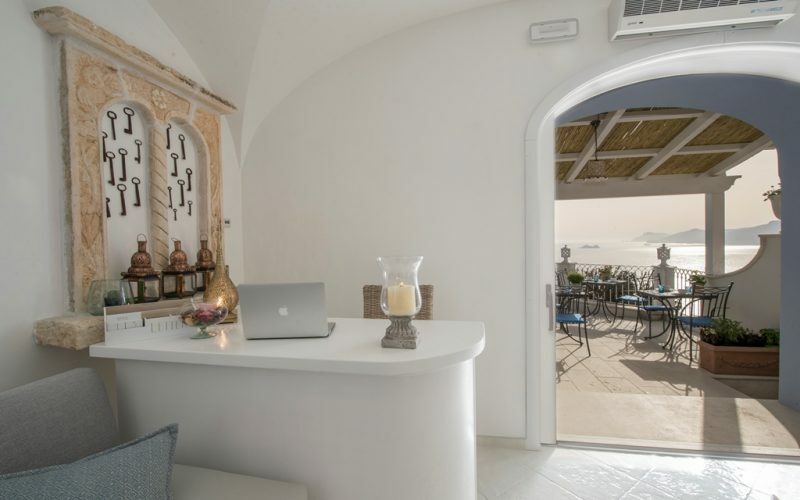 The stop for the shuttle bus to the center of Praiano, to the cheerful Praia beach and to Positano, is located opposite the bed & breakfast La Barbera.Within walking distance or by car, you can reach the Sita bus stop for Positano, Sorrento or Amalfi. 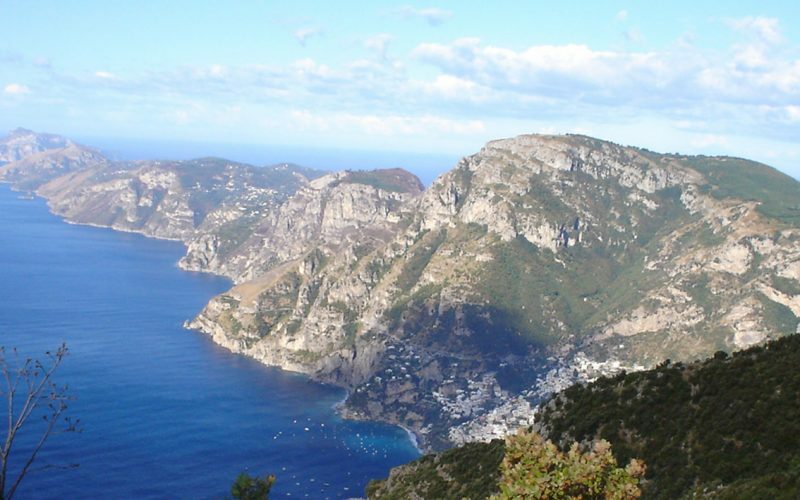 There are also tourist transport services.From the Praia beach, you can take boat trips along the magnificent Amalfi Coast, towards the Li Galli archipelago or towards Capri. The ferry to Capri departs from the dock of Positano. The Circumvesuviana station easily reachable by Sita buses is in Sorrento. Not far from the b & b La Barbera you will find restaurants, pizzerias, bars with internet-point, tobacconist, newsstand and resale bus tickets, gardens, disco on the sea, tourist information office, Praiano medical guard, pharmacy, bank counter, delicatessens , greengrocers, shops of local products, local crafts and various kinds, butchers, hairdressers, laundry.Contact our online staff to organize a fabulous stay and book directly from our site to seize the most advantageous offers, all year round! The reception of bed and breakfast La Barbera welcomes you with the lounge bar area, with sofas and LCD TV for your moments of relaxation. Our staff is at your disposal for all the useful information to make your stay full of events and unmissable excursions. On request, we offer cooking classes and pizza class, tourist guide, wellness treatment, transfer service to the airport or stations, advice on eco-tourism itineraries, food and wine tours, information on Trekking trails, the Path of the Gods, the path that leads to the Monastery of Santa Maria del Castro, on how to reach the beaches of Gavitella and Praia, on summer events and concerts on the path of the gods, on the summer festivities in honor of San Domenico with the famous and exciting Luminaria.We will also offer you information on car rental, with or without a driver, and motorcycles, scooters, and bicycles rental.To extend your stay in Praiano, before check-in or after check-out, b & b La Barbera offers you the possibility of luggage storage, on request. 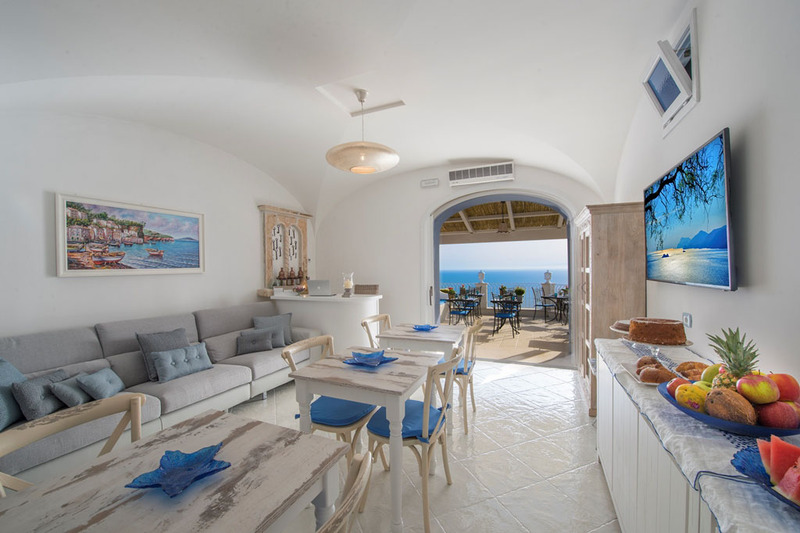 The stop for the shuttle bus to the center of Praiano, to the cheerful Praia beach and to Positano, is located opposite the bed & breakfast La Barbera.Within walking distance or by car, you can reach the Sita bus stop for Positano, Sorrento or Amalfi. There are also tourist transport services.From the Praia beach, you can take boat trips along the magnificent Amalfi Coast, towards the Li Galli archipelago or towards Capri. The ferry to Capri departs from the dock of Positano. The Circumvesuviana station easily reachable by Sita buses is in Sorrento. Not far from the b & b La Barbera you will find restaurants, pizzerias, bars with internet-point, tobacconist, newsstand and resale bus tickets, gardens, disco on the sea, tourist information office, Praiano medical guard, pharmacy, bank counter, delicatessens , greengrocers, shops of local products, local crafts and various kinds, butchers, hairdressers, laundry.Contact our online staff to organize a fabulous stay and book directly from our site to seize the most advantageous offers, all year round!